Honda has restyled the Jazz, its spacious supermini in time for summer. This is the third incarnation of the practical small-family car and it now comes with better refinement and uprated safety features. However, if you’re reading this in Japan, you’ll already know all about the merits of the Honda Fit, as it’s know in the Far East, as the new shape launched there almost 18 months ago. Honda has acclaimed the new supermini as a bold yet sophisticated design that comes with heaps of inside space and buckets of versatility. The infotainment system is better and improved safety has been a key consideration. The new Jazz is much curvier and classier than before. There’s much less of the ‘boxy but good’ look of the old model. But you’ll recognise the nose, the grille and the steep windscreen, and you’ll also be familiar with the tapered rear end. The story of the interior is one of better-quality plastics, contrasting upholstery and chrome detailing, while steering wheels are multifunction and, depending on which trim you choose, the infotainment screen comes in five- or seven-inch display. The larger version borrows the smartphone ‘pinch, swipe and tap’ approach and, indeed, runs off an Android system. In fact, bring your Android phone along for the ride and you’ll enjoy a MirrorLink set-up, offering traffic and weather reports and Internet radio. You can download even more apps from Honda’s App Centre, including a Garmin sat-nav. Honda has based the new Jazz on its new supermini platform, with chassis details from the HR-V crossover. There’s a neat trick in hiding the fuel tank beneath the front seats to allow for more floor space in the rear and for the Magic Seat system. This allows you to create space for taller objects by folding seat bases forward. 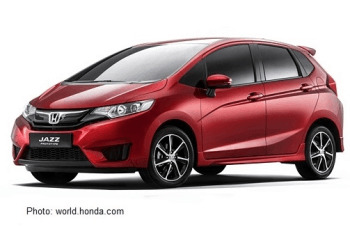 The new Honda Jazz will feature a 102bhp 1.3-litre i-VTEC petrol engine, in six-speed manual or CVT options. Suspension is lighter and the wheelbase longer for comfortable cruising. Honda is hoping for a five-star Euro NCAP rating, and is banking on the Advanced Driver Assist System, available on all but the most basic model, to achieve it. Features include active city braking, lane-departure warning and forward-collision warning. The new Honda Jazz will be available from Howards Group showrooms in Weston-Super-Mare and Taunton this summer. Pop down for a test drive.